Publisher Desc. With a text by the African American poet and Renaissance man Gordon Parks, this piece was commissioned as a gift to the New Orleans Children's Chorus by the San Ramon Valley High School Choir in Danville, California. After the devastation of Hurricane Katrina, the high school singers spent their spring break helping with relief work and followed those efforts with this donation. 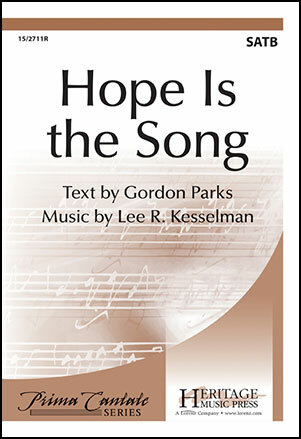 The students have set a powerful example for all of us, and that example is underscored by the phrase "Hope is the song I have chosen to sing."